As you may have guessed from the recent abundance of posts, we are taking advantage of the long holiday weekend to do some projects around the house. The overall theme is personalizing the home. Since we started de-personalizing and staging our old house in September of 2010, our living arrangements have looked more hotel or model home than family home. As nice as that might be, we built this house to be our home, and now it's time to make it gezellig. A few days ago, we were at HomeGoods and found a Thomas Train set on clearance for $30. The set currently is on sale on Target for more than $50. Since we don't see the train obsession ending anytime soon, we decided to buy it and hold on to it til either December (Sinterklaas, D's birthday, Christmas) or as an incentive for something big. Niels and I have been talking about formalizing our expectations for D around the house, so this purchase was just the nudge we needed. I found this really cute templates on Pinterest. 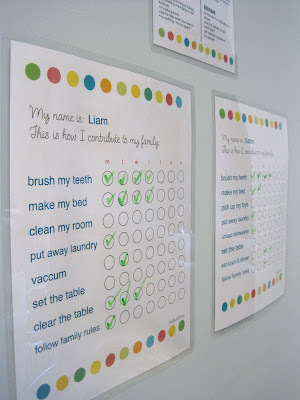 I really like the idea of saying "This is how I contribute to my family," instead of Chore Chart, like Erin from Sutton Grace does in this photo. Please do not pin this photo from our site. Please pin from the source, Sutton Grace. We've been talking quite a bit about what exactly is reasonable to expect D to do at age 3.5. This is where we landed. Fortunately, since I made the chart myself, it'll be easy to change or update as we go along. Since Marissa's role will be as a family member, not a guest, I made a chart for her, too. After consulting with a few friends who have hosted exchange students, friends with teens, and Marissa's parents, here's the list we came up with for her. I printed both lists out, thinking I would laminate them, like Sutton Grace did. But then, when I decided that I would put them on the wall by the command center in the kitchen, I decided I wanted to frame them instead, using the glass to turn them into dry erase lists. I did test out the look before we found our frames at Ikea. D reminded me that I had made him special jars for his money. I had to swap out the first set of jars with some old olive jars that fit the Ribba ledge better. How the jars will work is that each week, we'll tally up the checks on D's chart. He'll get a nickel for each one. He'll then put 10% of his earnings in the share jar to give away (at church, or to meet a need of someone else), 50% will go in the save jar toward something he really wants, and the remaining 40% will go in his spend jar. We'll pay him on Saturday morning, so he can take his spend money with him when we do our weekly shopping run. If he wants something that's not on our shopping list, he has to have the money to pay for it himself. If he doesn't spend his money right away, he can put it in his save jar. I'll put a photo of whatever he's saving for in that jar, along with the price, so he can have visualize his goal. So far, D hasn't had too much of the "gimmes," and is very good about returning things he finds in stores "to their friends" before we leave. However, I'm sure closer to December, we'll help him come up with a wish list similar to what we do for ourselves, where we prioritize the things we are saving for, and note the price of each. The other tool in our parenting arsenal is the reward and consequence jars. Between these two ideas, we're pleased to see our son contributing to our family with a (mostly) happy heart. I'd love to hear what other parents expect as family contributions from their kids. Linked on: I Heart Naptime.